High Society is a Popular Microgaming Pokie (slot game) which can be found at all Microgaming Casinos and sites which offer 100's of Microgaming pokies at Pokies Palace and other online Pokies sites. 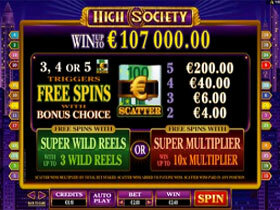 High Society is a Microgaming Pokies which features 5 reels and 25 pay lines with icon images of living a richer life. 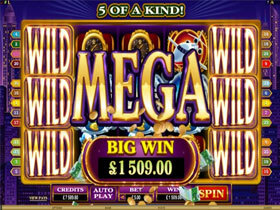 The game features a Super Wild, a Multiplier and Free Spins. Bets start from as little as 0.01 and with huge pay out potential and are ideal for all types of players. 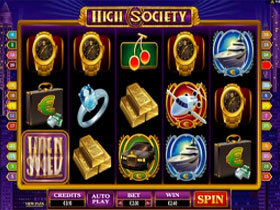 High Society Pokies Bonus Game is triggered when a Scatter Symbol appears on Reel 1 and Reel 5 at the same time, and then the player gets to choose which Bonus Feature they want to play. They have a choice between the Super Wild Reels Bonus or the Super Multiplier Bonus. During the Super Wild Reels Bonus players will be rewarded with 10, 15 or 20 Free Spins, and during each Free Spin either reel 2, 3 or 4 will turn Wild. With the Super Multiplier Bonus players will be awarded with 10 Free Spins and all winning pay outs will be multiplied. The multipliers starts off at 2x, 3x or 5x on the first Free Spin and increases on the second, third, fourth and fifth Free Spin.